The Porter-Cable C2002 pancake compressor we will review here is available with and without a 13 piece accessory kit. The C2002-WK kit comes with a 25 foot hose and blowgun with several nozzles that you can connect to it. Nozzles for tires, basketball etc. We will discus that later in the review. Since both have the same pancake compressor we will focus on the review of this first. Can be used for spray paint but test first. The porter cable pancake compressor seems to have regulator problems and our first advice is to start testing it as soon as you receive it. Read some complaints that people did not start using after the warranty period was over and could not return it anymore. I also read some problems with the water drain valve being stripped out. With about 15% 1 star ratings I get curious and start digging into that. Like I mentioned there were quit a lot of people waiting too long to start using it and did not have the warranty anymore. For the rest I read a comment from a contractor who used this compressor for 3 years almost daily and was disappointed that it broke down after 3 year. Lets be honest this is a pancake air compressor not a big compressor that is built on the back of a truck. 3 years continues use is pretty rough on this light compressor. I would no complaint about that. Someone let it run constantly for over an hour and was surprised the rubber hose and pump were getting hot. This means that the number of 1 star ratings seems high, but it does not reflect the real quality of this compressor in my opinion. 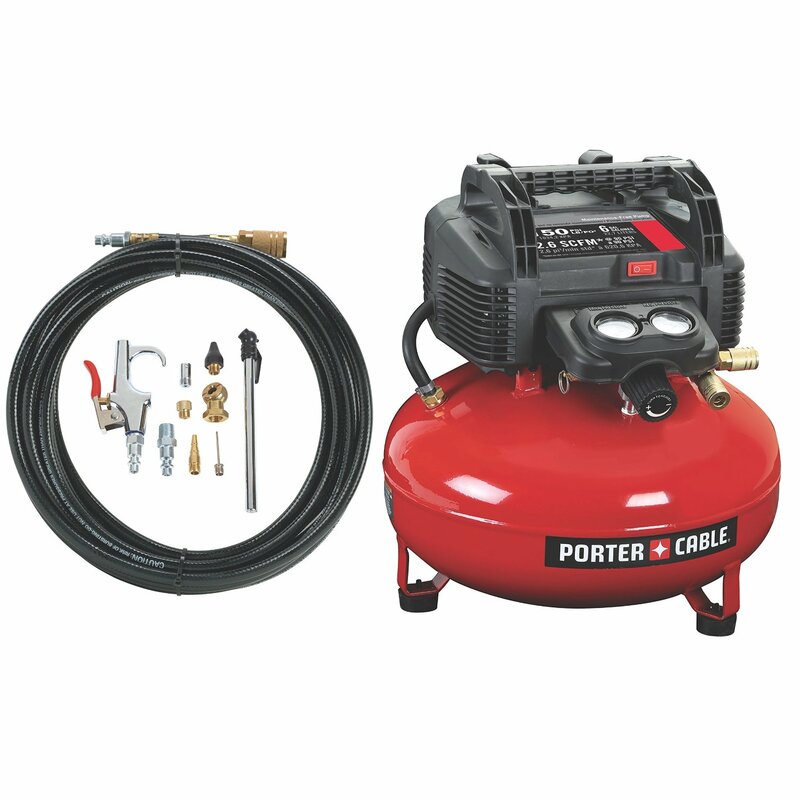 Overall this Porter-Cable C2002 pancake air compressor received more good reviews than bad ones. 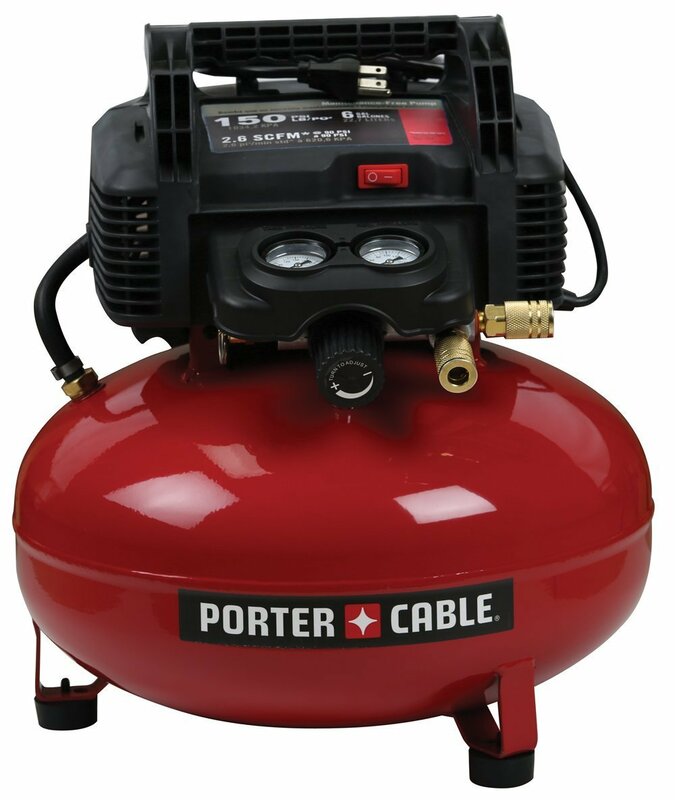 We just recommend this air compressor for average use and taken the price in consideration this is what you should expect from it. Its good for trim finishing and airing up tires and should lest a long time than. If however you start using it day in day out on a construction job for framing it will last not for years and years of-course. This pancake compressor is comparable to the Bostitch Pancake Compressor you can review here also. Like we mentioned this is the C2002 with a 13 piece accessory kit and the compressor part is the same. The only thing is that I can only count 11 parts on the picture and I read in a review the same thing. Unless they count the hose connectors as a separate accessory? However, it is a nice package with a lot of nozzles that you can attach to the blow gun. But looking at the price difference between the 2 I suggest you to have a look at the accessories and see if you will use them. Maybe you are better of buying a separate hose and blow gun? Some tools you use might need an air dryer or lubricator so read their manual first.